This is an original Alexander Calder weaving, not a new production. Zebra is a stunning and colorful work of art designed by the artist in 1975. Numbered in an edition of 100 with Alexander Caler's inititals in the weave. This weaving maintains Calder’s primary colors of red and black. Zebra's iconographic image is whimsical and playful. Artistic, sturdy and utilitarian, this weaving was presented to the public in 1975 as a "soft sculpture", intended to be used as a wall hanging. 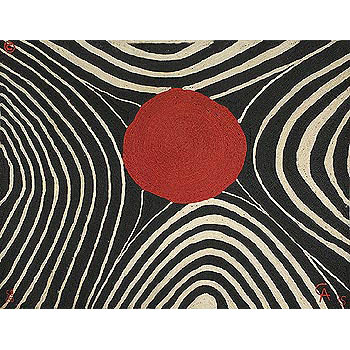 For this project Alexander Calder provided the gouache drawings and approved the colors of the hemp. During 1974 and 1975, Indians in remote villages of Guatemala, who had a long tradition of weaving, used the colored hemp to weave these wall hangings. The project aimed to preserve the culture of the indigenous people by having the Indians use their traditional skills to execute works of modern artists. Produced in a limited edition of 100. This work, was not woven, but braided, a technique devised to accommodate Calder’s complicated designs and color patterns. Each weaving is therefore unique since it was hand made. Calder was said to have been so impressed with the workmanship that he acquired a few for the floor of his home and studio in France, as seen in some photographs of his living room in Paris. Designed by Alexander Calder and produced by Central American weavers of Guatemala to benefit the earthquake victims of Managua in the 1970s. Three earthquakes (that led to the making of the tapestries) struck the city of Managua, Nicaragua’s center of government, commerce and industry, on Dec. 23, 1972. Neighboring countries like Hondouras, El Salvador and Guatemala responded immediately. Political figures like Richard Nixon, then president of the United States, sent charitable missions. Pope Paul VI sent a message of prayers and blessings to the Nicaraguan people. Celebrities like Roberto Clemente mobilized Puerto Rico and Mick Jagger and his friends presented concerts. And Catalina (Kitty) Meyer, a Manhattan socialite spearheaded a colossal visual arts project. This exhibition looks into her unique mission that produced Alexander Calder’s hammocks and wall hangings. Kitty Meyer was a Polish Jew who escaped World War II by fleeing to Nicaragua with her family. She grew up in Managua and moved to New York 15 years later. Her response to the calamity of 1972 was to create an arts mis-sion to rebuild Managua. Often described as a “fireball,” Meyer had been known in the art world as an art collector and a friend to many world-known artists. In 1973, she set out on a daunting task, centered on the visual arts, putting together auctions in collaboration with major auction houses, artists, dealers and collectors. Works like Salvadore Dali’s oil painting, “Homage to Nicaragua,” valued at $10,000, and Andre Derain’s “Chambourchy,” valued at $25,000 (prevailing 1972 prices) were up for sale. Five artists responded to a letter she sent to the Art Committee for Nicaraguan Relief requesting lithographs for reproduction. Alexander Calder was among them. In 1973, Meyer visited Calder in France, bringing along a Masaya hammock as a gift for his lithograph donation to the Nicaraguan cause. Masaya hammocks, a popular product of Nicaragua, are made by natives who live by the lake southeast of Nicaragua. Calder was fascinated with the workmanship of the hammock and, with Meyer’s support, an idea took hold that led to the making of the Calder hammocks and wall hangings. The Masaya artisans were to create hammocks and the Guatemalan artisans the wall hangings using Calder’s designs in limited editions of 100 per design. The agreement between Calder and Meyer aimed at providing the weavers income four times the going rate. The materials were provided free to the weavers. Eight initial designs were made by Calder. The pieces maintain Calder’s primary colors of red, blue and yellow, and his iconographic images are, at times, whimsical, and always playful. Artistic, sturdy and utilitarian, the hammocks were presented to the public as soft sculpture. Calder also designed the stand, giving the pieces some air-driven mobility. The pieces were exhibited at leading galleries in Manhattan and traveled to many Latin American cities as well. Calder’s designs were also translated into flat works of mural size that have been called tapestries, wall hangings and floor mats. Because they are intrinsically stunning, the works are usually displayed on walls rather than put on the floor. Calder created six more designs for wall hangings, making a set of 14 pieces produced in limited editions of 100 per design by Guatemalans, who are well-known worldwide for their weaving. The works, however, were not woven, but braided, a technique devised to accommodate Calder’s complicated designs and color patterns. Calder was said to have been so impressed with the workmanship that he acquired a few for the floor of his home and studio in France, as seen in some photographs of his living room. The wall hangings project was a financial success and the fundraising revenue covered production expenses and wages for more than 100 peasant weavers from Central America.